The origins of the ancient martial art of Kalari-payattu are lost in hoary antiquity. According to some of its proponents, it was the sage Agastya Muni who developed the Kalari fighting technique, while others claim that the great warrior-incarnation of Vishnu, Parashurama created Kalari. 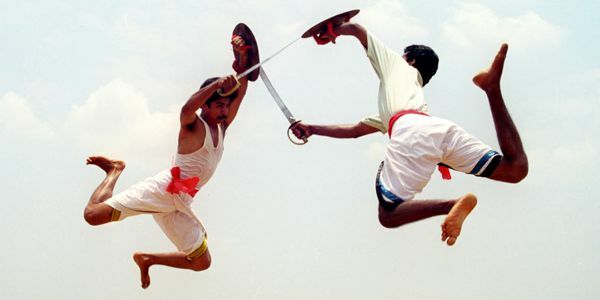 Kalaripayattu is indigenous to the South Indian state of Kerala and derives its name from the Malayalam word ‘Kalari’ which literally means ‘battlefield’. In respect to this martial art, kalari refers to the arena where training goes on and demonstrations are performed. Originally, the Kalari was a place of learning for subjects such as ayurvedic medicine, yoga, philosophy, astrology, architecture and geometry in addition to combat arts. These traditional schools are square-shaped buildings made of bamboo and thatch, dug into the earth and lit by oil-lamps. Each Kalari is run by a ‘gurukkal’ (teacher) who teaches the students the esoteric physical and spiritual disciplines needed to master Kalaripayattu. There are three main styles of Kalarapayattu, northern, southern and central, stemming from these regions of Kerala. Each of them have particular aspects and fighting skills that distinguish them from each other, such as the importance of ‘marmas’ (pressure-points) and the invocation of certain protective deities. According to both Indian and Chinese historical sources, in the 4th Century AD a Buddhist monk named Bodhi Dharma took Kalarapayattu to China and from there the systems of kung-fu and karate eventually emerged. This style became more developed during the 9th century and was practiced by the warrior clan of Kerala, the Nair community, to defend the state and the king. The ancient warrior spirit was also retained throughout the centuries by the warrior chieftains of ancient Kerala known as the Mamanka Chekavers and the Lohars, the Buddhist warriors of North Kerala. Thus, this martial art flourished until 1793 when the British East India Company banned it. However, it continued to be practiced in secret by a handful of stalwart adherents, and it is due to their perseverance to keep this tradition alive that the present-day practitioners continue to teach the mother of the worlds martial arts.